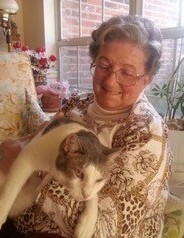 Anna Mary Oravetz Brackenridge, 78, a resident of Baton Rouge, La., passed away on Feb. 8, 2019 after a two-and-a-half year battle with metastatic breast cancer. If laughing was a language, Anna Mary was fluent. Her friends, family, and church family were often the benefactors of a little joke, silly saying, or interesting factoid stored in her sharp memory. Faithful and generous, she served at St. Jean Vianney Catholic Church as a religious education teacher, as a eucharistic minister, and through a myriad of other services for 35 years. She worked in East Baton Rouge Parish schools as a substitute teacher, and she was an active member in a variety of clubs. Before moving to Louisiana in 1983, Anna Mary taught religious education at Guardian Angels School in Clawson, Mich. Raised with a love of education, she graduated from Seton Hill College in Greensburg, Penn., in 1962 with a degree in chemistry. While pursuing her master’s at Ohio State University, she met her husband, David Brackenridge. Anna Mary was a life-long learner, collecting books of all kinds. In fact, she collected everything, because someone somewhere could use it someday. Anna Mary loved music, singing, teaching, sewing, crafts, a silly joke, the daily Jumble word puzzle, meeting new people, and catching up with old friends. And most of all, she loved her family. Anna Mary is survived by her husband of 54 years, David Brackenridge, daughter, Victoria Kay Brackenridge Travis and husband Kent Travis, daughter Laura Brackenridge Danahy and husband Rich Danahy, brother Robert Oravetz, grandchildren Jacob Travis, Sophie Travis, Joe Danahy, and Sarah Danahy. She is preceded in death by her parents Demetrius and Agnes Oravetz. Visiting hours will be at Resthaven Funeral Home on Feb. 14 from 4-7 p.m. and at St. Jean Vianney from 9:30-10:30 a.m. Feb. 15 until funeral Mass at 10:30 a.m. Burial will follow at Resthaven. Pallbearers will be Bob Oravetz, Gene Kaderbeck, Kent Travis, Rich Danahy, Jacob Travis and Joe Danahy. In lieu of flowers, friends may donate to Susan G. Komen or to a charity of their choice.